I have a fondness for impossible crimes (fictitious ones, that is), and I often prefer them to whodunits. 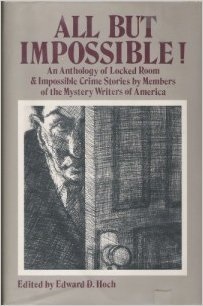 Characters in a whodunit have the potential to reveal whatever convoluted backstory the author needs to justify the plot, but a locked door is a locked door. If the detective tells you there’s no hidden passageway or secret catch on the window, you know the criminal didn’t get out that way. Plenty of these stories feature magicians as detectives, for the howdunit usually relies on a sleight of hand with the audience; just because a character hears the smash of a windowpane doesn’t preclude the possibility that the windowpane had been smashed many hours before, and what the character heard was merely a recording of glass breaking. Today’s story has one of the best locked room solutions I’ve come across in a while. Here’s the setup: Dr. Ceccioni is an Italian exile living in Lyons in relative poverty. It’s the local rumor that he fled his country because of powerful political enemies, so it doesn’t come as a complete surprise when one day he arrives at the police station with a note he’s received: that he will die in his home the following night. Corporal Manchard, an officer with a spotless record, vows to prevent this from happening. He searches the house before surrounding it with his men, and passes the night in vigil. But at 3am when Manchard comes in to check on Dr. Cecconi, he finds the man lying on the bed, a bullet just above his heart. “No one had entered the house! No one had left!” he groaned. “I’ll swear to that as though I’d stood guard myself: I know my Corporal Manchard. And don’t go thinking that they found the revolver in the house. There wasn’t any revolver! Not in sight and not hidden. Not in the fireplace, or even in the roof gutter. Not in the garden – not anywhere at all! In other words, a bullet was fired in a place where there was no firearm! So, how do you think it was done?